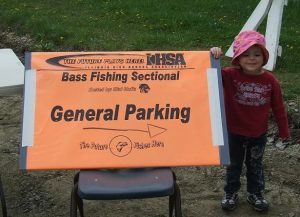 Which state was first in the nation to hold a high school bass fishing state tournament? Read on for the answer to an event where me, Dad, Julie and our youngest daughter, Carly, had a lakeside seat for that very first weigh-in. However, we weren’t quite as close to the action as the high school angler and school we were there to support, Dylan Breuer and Canton High. Below is the posting I compiled shortly after the event unfolded. 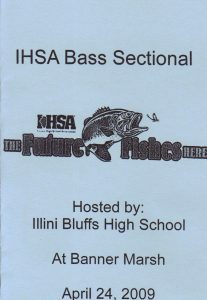 Rather than just learning history, a substantial number of high school students actually got to make history on April 24, 2009 as Illinois became the first state to conduct a high school bass fishing state tournament. I had the good fortune of being in attendance at the well-organized Banner Marsh Sectional along with Dad, Julie (eight months pregnant at the time), and our youngest daughter, Carly. An added bonus was a kid from one of the Canton High School teams by the name of Dylan Breuer just happens to be our nephew (he’s the son of Julie’s brother, David). While the day ended a bit on the windy side it was hard to complain in light of our recent bouts of rain and cool temperatures. It was a very well run operation especially for a maiden voyage. Teams fished from just before 8:00 am until 3:00 pm with the goal of bringing in a five bass limit (a twelve inch minimum length limit was in effect). 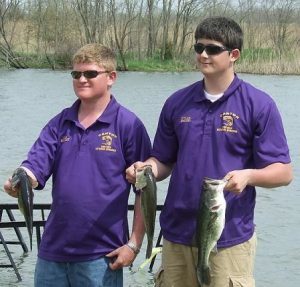 Dylan (above right) and partner Nick Wright (above left) were the first to weigh-in and their catch of 6.24 pounds wound up placing them ninth out of twenty one teams. Dylan landed two of the three keepers including their big bass that tipped the scales at 2.65 pounds. 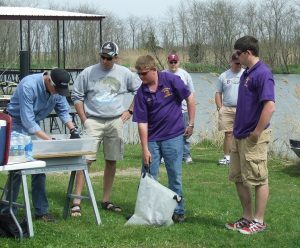 Depending on the efficiency of the weigh-ins at the other sectional sites, Canton #1 may have recorded the first catch in high school bass fishing history. Okay maybe that’s a bit of a stretch but at any rate, they were certainly the first in our neck of the woods. I am proud to say that I was there to see it happen. The top three finishers at the sectional (Pekin, Farmington and Peoria Richwoods) moved on to fish the state finals at Carlyle Lake on May 8 & 9 which was won by West Frankfort. Farmington’s twenty seventh place finish was tops among the Banner qualifiers. Now this is when the Friday Flashbacks start to get more entertaining for me. Sure, it’s fun for me to reminisce about and revisit the old pics and log entries of some of my catches. But when I get to include a batch of fishing and outdoor companions, well, that just adds to the appeal in my book. So, if you are sick of just seeing my smiling mug on Friday, hopefully the variety that heads your way as the Fridays continue to roll by will be just the cure. 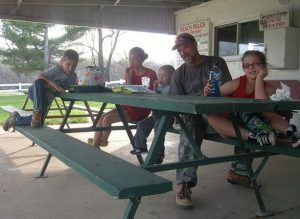 This week features a Dad day with the kids at Little John Conservation Club. An afternoon as a fishing guide/dad. Last Saturday my wife, Julie, had some painting that she was working on around the house so it was my duty to get the kids out of the way. Fishing sure sounds like a good fatherly sort of guided activity, right? Anybody ever tried that one with an ambitious two year old, his four year old brother, seven year old sister and nine year old sister? It was a trip, but we all came through unscathed. First up was bait which consists exclusively of waxworms when I fish with younger kids as they are bite-sized for bluegills and considerably less messy than dirt dwelling fish food. The gas station had them in stock but apparently they had been residing in the fridge for a while as close to half of each container was dead. As a result, I was able to talk the clerk into a two for the price of one deal and checked one task off my list. Next up were five lunchboxes which Julie put together while I made sure we were rigged up with slip bobbers and had five poles in casting order. In addition to waxworms, slip bobbers are a must in my book as they allow small anglers to present their baits at just the right depth while less dangling line theoretically makes them a bit less dangerous while casting. Of course, there was a stop on the way out of town for a drink and a treat at another gas station to help everyone survive the twenty minute trip without starving or dying of thirst. The nasty combination of soda pop, juice, beef jerky, chips and dip ran just over $25. I couldn’t help but recall the days where you just got gas at the full service station complete with a window wash and your folks paid cash to the attendant who dispensed change out of one of those cool coin changer belts. All told we fished for maybe thirty minutes in the middle of some playground fun and a picnic supper followed by another brief visit to the playground. The funny thing is I had the little guy, Zac, rigged up with only a casting weight in the interest of decreasing the odds of someone getting hooked. Well, Jayce and Helena thought that setup looked pretty good in terms of casting practice so they asked to go that route as well. In the end it was just Carly who was actually armed with hook and bait. Zac proceeded to get repeatedly tangled in his line as he wasn’t quite getting the concept of reel the plug back in before attempting to cast back out. His superhero pole represented Superman but at one point would have been better suited to bear the markings of another comic book character. Aquaman would have been more fitting during a bout of frustration where he up and threw the whole setup into the lake. It was retrieved and time will tell in regards to any lingering effects (on both the pole and the little guy’s interest in fishing). Jayce did a good job with his casting practice at one point launching his plug clear across a narrow chute into a tree branch roughly a dozen feet above the lake’s surface. He also displayed a pretty good arm tossing rocks and raising the ire of his fishing sister who informed him that he needed to find a direction other than towards her bobber. Helena was very impressive with her casting abilities as she fired her plug record distances out into the lake. She even put her tablet down for nearly the entire trip which I found almost equally as impressive. Carly was our lone angler and came through for us with our solitary bluegill. 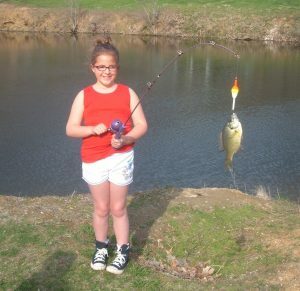 Prior to her success she had wondered how “you and Uncle Brent catch so many big fish.” She even requested that I make a couple casts to try my luck but I came up empty. She was quick to point this out to her mother upon our return home, boasting that she had outfished Dad (if you read some of my reports you are aware that isn’t always hard to do). Last Saturday also happened to be the eve of Carly’s First Communion and she had several questions, seeming more than a little nervous about the whole affair. However, after her catch she related that she had “asked God” to help her catch a fish and lo and behold it worked. I’m filing that one away for the next time I’m out in the midst of a cold front. A good time was had by all and nobody fell in the lake so all was well. About the only moment of concern was some trepidation over using an outhouse but we got through it (I will spare you the details). 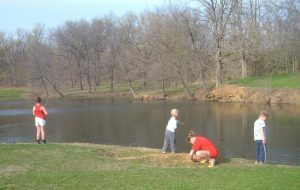 Overall, it sure was good to get some fresh spring air and I love it that my kids feel right at home getting out of the house; must be doing at least something right along the way. There are some catches that stick with you and this bass is one of those. I remember it like it was yesterday although it was actually 20 Easter’s ago. 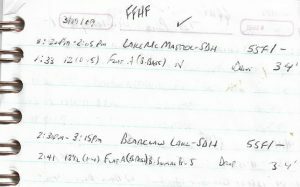 And 20 years ago I could actually get away with joining forces with Dad for a Lake Storey Easter Sunday morning fishing trip. Yep, the days of Easter egg hunts were still several years away. I can tell you exactly where and how it was caught too and I suspect Dad can as well. A sunken Y-shaped tree in a cove in about three feet of water. A perfect setup for my Blue Glimmer spinnerbait run parallel to the structure at a pace just fast enough to keep the blades moving and the bait hugging the tree. Textbook bassing and always a great feeling when it works, makes you think you know what you are doing. Throw in the fact that it was the largest bass I’d landed at Lake Storey up to that time and it makes for an even more memorable tale. 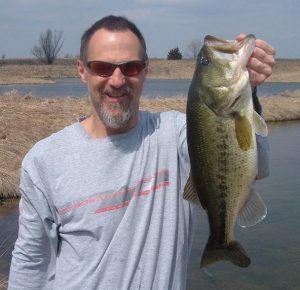 However, it was not our largest Easter bass of all-time. 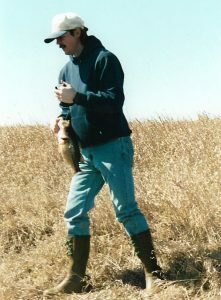 Nope, that distinction still belongs to my fishing partner on this day, Dad. 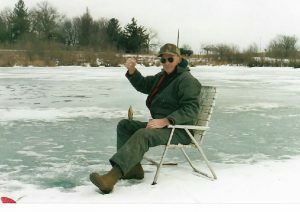 Not so surprisingly, I was also his fishing partner on an Easter morning in 1987. 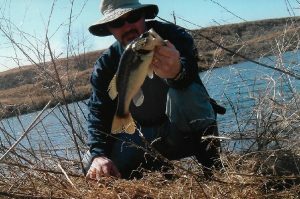 And just like today’s flashback I know exactly how and where that one was caught too, shoreline stump on a purple spinnerbait. 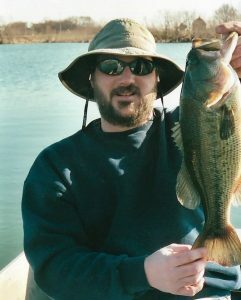 It is the only bass I ever recall seeing caught on a purple spinnerbait. 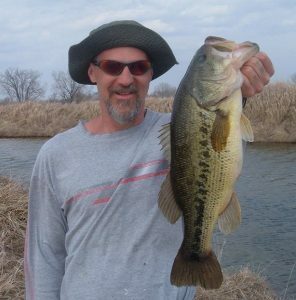 I suppose that Dad likely fooled a few others with it on that day but they kind of fade in comparison to the family Easter bass record of 5-4 (unfortunately no picture exists of this fish so you’ll just have to trust us on this one). 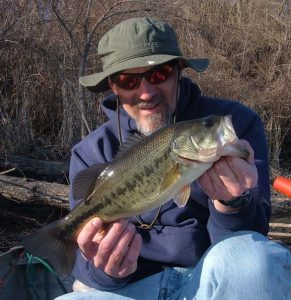 Today’s flashback features my first bass of 2014 which allowed me to meet the March bass goal with only a couple days to spare. It came from one of a pair of Snakeden Hollow potholes that I refer to as “The Craters” since they don’t have a real name. There’s a North Crater (where I nabbed this fish) and a South Crater separated by a narrow strip of willow covered ground that is nearly impossible to navigate. The terrain where I caught this one is straight up strip mine country as the water behind me in this pic sits about twelve feet downhill. And when I say downhill, you actually have to slide/crawl/climb to get to and from a small foothold on the bank. 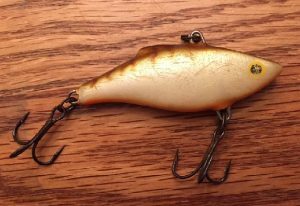 A few yards across the narrow finger is a sunken, brushy tree that often holds a bass that will take an interest in a black and blue jig and pig. Go To Spot – For the last three years, my initial bass outings have been to a couple potholes at Snakeden that have yet to let me down. More specifically, bass number one for 2012, 2013, and now 2014, came off of a sunken bit of brush on the good old jig and pig. While I’ve yet to catch anything particularly large out of these waters (lake record stands at 1-12), proximity and reliability keep me coming back to start the annual quest. My six minute, moderate difficulty walk turned up bass number one on my fourth cast of the year. I spent another forty minutes casting the general area without another bite but left satisfied nonetheless; mission accomplished. I had a good time, got a bit of a workout, took in some much needed fresh air and enjoyed open water after too long of a winter (145 days between bass). In the process I also fooled a few bass for icing on the cake. Nothing particularly noteworthy in terms of quality but I was happy to get bit. And you know me; I’ll write and ramble about fishing regardless of what is caught. 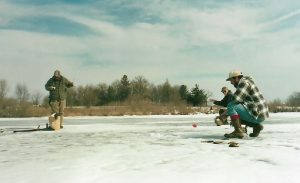 We head back 15 years today with a look at an afternoon of strip mine fishing with a couple of the Brothers Jackson. 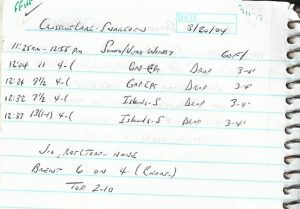 And for added effect, you get the original post from a larger fishing report originally submitted to family and friends on March 27, 2004. 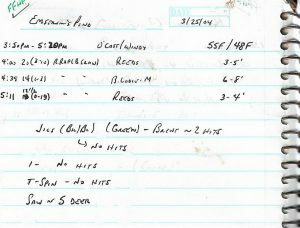 March 20 – Brent and I head out for Snakeden Hollow for some biking and bassing. Air temperatures were around 60 F with sunny skies and strong winds out of the Northwest. Our first target, Long Lake, was rather disappointing as we failed to catch any bass in about forty-five minutes of fishing. Jigs, crankbaits and jerkbaits all failed to produce. 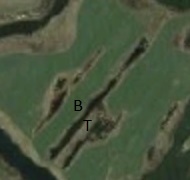 This lake is typical strip mine habitat with steep banks and crystal clear water. Looking for a change of pace we headed up the bank to a shallower lake that had more stained water and more diverse structure. This is kind of fun as I took this shot of Brent’s new lake record from “across the lake”, not far in a straight line but a long walk in strip mine distance. We spent about an hour and a half on Crosscut Lake and combined for ten bass. Brent posted an addition to the record book with a 2-10 that hit a Mann’s 4- crankbait (chartreuse). 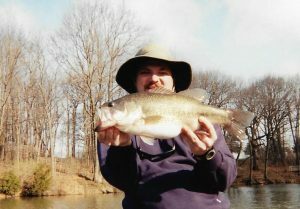 The bass also broke the lake record of 2-0 set by Tim Townsend on 3/23/00. All of our fish came on Mann’s 4- crankbaits worked with a steady retrieve along dropoffs in 2-5′ of water. 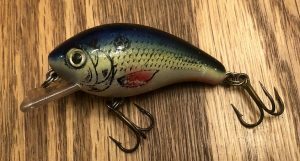 Jigs produced a couple strikes without hookups and lipless crankbaits got no attention. After working over this relatively small body of water, we decided to head for Little John. However, we had to bike back to the truck first, directly into some fierce winds. At one point, the wind actually exceeded gravity. We had to pedal to go downhill as the wind was so strong that we couldn’t coast. Not exactly a treat paired with my current level of physical fitness. Still have the lure that did the trick per the above database entries but can’t tell you the last time it hit the water. Hey, how about that? Open water in these photos, looks good. Not so much in 2019 and I suspect that we’ve still got a final weekend of icefishing on the local haunts. 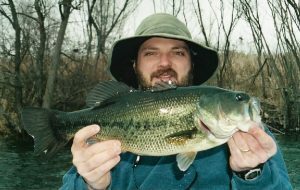 It will be interesting to see how things play out in terms of getting on the board with the annual goal of a March bass. A goal that has been achieved every year since 2002 (with a few bonus February catches thrown in the mix). 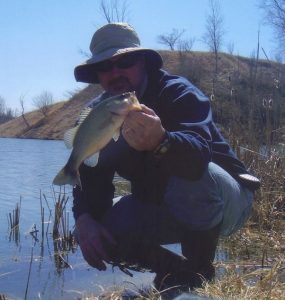 This first pair of bass from ten years ago came from two walk-in lakes at Snakeden Hollow in Knox County, IL. 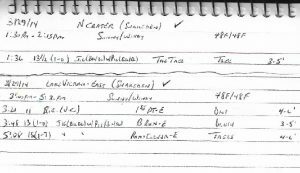 From 2009 through 2014 this was the standard plan for nabbing the first bass of the year and the collection of strip pits never let me down. Here’s the original, brief report that was submitted as part of the rundown on the start to 2009. 2009 is off to a slow start for me, much the same as 2008. Weather, work and family responsibilities have all conspired to keep me off the water. I managed a pair of bass on 3/19 from a couple Snakeden Hollow lakes with the larger of the two (actually more like the least small) weighing 1-4. Both came on Bomber Flat A crankbaits (baby bass). We revisit Emstrom’s Pond for the second Friday in a row and we’ll see it again before this whole Flashback project is over. Sooner than you think, really. But it was the kind of place that was worth visiting over and over again during the sixteen years that we had access to the fishing hole. 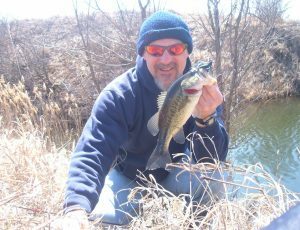 For today’s post we look at an early season lone bass outing on a perfect spot to take a shot at a challenging cold water bite. The pond was barely outside of the Galesburg, IL city limits which was just right for a quick evening hit for an hour or two to try our luck. 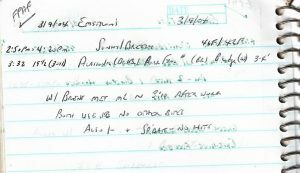 Here’s the scoop from the original report posted in March of 2004. 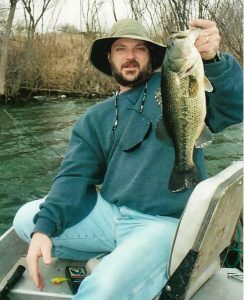 Although the weather wasn’t exactly balmy, the results sure made it much easier to bear as we now have a new “Top Bass” for 2004. As I sat around home on Tuesday (3/9), I debated on whether or not to give Emstrom’s Pond a shot. Around 1:00 pm, I decided to phone Time & Temp for weather conditions. I told Julie that if it was 46 degrees or above I was going. Although my temperature limit was just off the top of my head, 46 degrees turned out to be the exact temperature when I called. Therefore, it was time to pack up and go. I anticipated fishing alone as Dad had some stuff going on. However, after about twenty minutes on the pond, Brent showed up. He’d just gotten off work and stopped by Mom and Dad’s to see if anyone was fishing. About a half hour after he arrived we moved in for a closer shot at The Beaver Lodge since our efforts in deeper water hadn’t produced any bites. Not long after Brent dropped the anchor, I felt the old familiar tap through the rod blank. As I stated, “There’s a hit,” I rammed the hook home and was rewarded with a tug back in response. I wasn’t sure if I got a solid hookset, but after a few thrashes on the surface I boated my first bass of the year. My concerns on the hookset were unfounded as the jig was completely engulfed and firmly hooked in the top of the fish’s mouth. Brent guessed the weight at 4-6 while I went for 3-5. Seems both of us were a little rusty as the fish nearly split the difference, tipping the scale at 3-11. 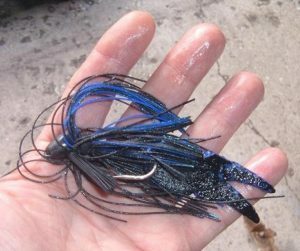 The fish fell to a jig (black/blue glitter) and pig (#23 kicker frog-black). It was our only hit in around an hour and a half on the water but well worth the trip. It was also convenient that Brent showed up to witness the catch. Not to mention he got anchor duty in the chilly water and served as photographer, hopefully producing better results than some of my self-portraits. I’m sure I’ll get to return the favor somewhere along the way. Anyway, a great fish for my first bass of the year. 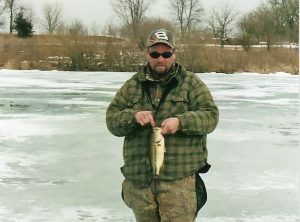 Sure have heard a lot of icefishing stories lately as it has been a banner season for those who take to the hard water. Me, not so much. I’ll stockpile my time away from home and wait for open water. 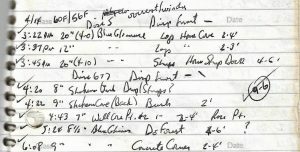 While I wait, here’s some pictures and the scoop from the last time I went icefishing just as it was written up in the original post entitled “Outdoor Update” on March 3, 2004. 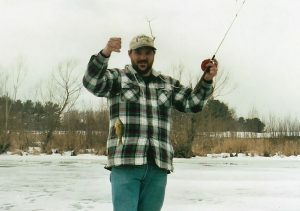 “On 2/19, Tim Townsend joined Dad and me for some icefishing at Emstrom’s Pond. Seven to nine inches of ice coupled with air temps in the low to mid 40’s is my type of icefishing. I wanted to get out just to say I went considering I hadn’t been icefishing for probably six or seven years. I’m not the diehard that Tim is as exemplified by what we each consider suitable conditions. 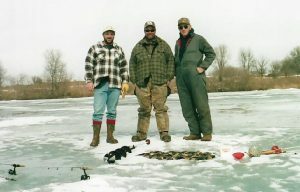 Tim had a few stories about not standing too close to his fishing partner in order to keep the ice from collapsing or being able to see the bow in the ice from an angler’s weight. No thanks for me; I’ll put in the extra effort to drill through a few more inches. Anyway, it turned out to be a successful outing, once we located the fish.